They say you’re judged by the friends you keep. As a website, we’re judged by the links we make. Our reputation (and the reputation of everyone who participates in the EzineArticles platform/system) is on the line with every single outbound link included on every single article. That’s why we’ve spent a year studying, cross-checking and verifying various RBL’s (Realtime Black List) services to ensure we’d be able to correctly identify if a link is from a known-and-verified-to-be-a-potentially-harmful link (reputation wise) that goes to an individual or organization that engages in UCE (Unsolicited Commercial Email) spamming/phishing, etc. Or if the link is from a reputable source. Within the world of RBL’s, URLs/Links are often separated by degrees of white hat, gray hat and black hat based on whether the URL is known to be a spam source, phishing source or both. Usually, the RBL’s are only able to verify domains that appear in spam rather than where the spam is sent from … but over time, and with manual checks, the RBL services are able to differentiate what’s legit vs. not legit. “The URL you have selected is blacklisted as it contains a domain that is actively used by spammers: [URL in question shown here]. Please remove this from your article. If you feel your URL was incorrectly rejected for being in the RBL, please contact our Member Support Team via email and we will research the issue and get back to you. 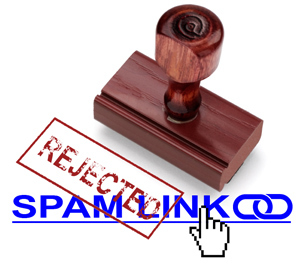 The chance of our RBL system rejecting your URL is extremely rare … unless you send a lot of unsolicited commercial email (not a good thing to do). That’s a good addition because I have even found malicious links in articles that look harmless. I am glad that you are looking out for us and especiallyabout spam and phishing. Thank You. Good move. Anything to cut down on spam sites is good. It’s a good feeling to know we are in “Good Hands”. This is a good addition to your website to make sure that both the reader and the writer have good positive experience. Wow…. great idea. I did not even think about how such a great site like this could lose credibility due to some bad links. The ONLY people who will lose on this is spammers. A big problem is that new sites or Web 2.0 sites are constantly categorized as spam sites. There are some really good sites that have very little content and/or pages. I guess defining what a spam site is is crucial. I’ll go against the flow and say I think this is a BAD idea. Anybody who’s been unfairly put on the RBL knows what I’m talking about. Have you ever been accused of something but you were innocent? Sometimes it’s almost *impossible* to prove you didn’t do something. I’ve NEVER spammed but have found one or more of my domains on an RBL at times because someone didn’t like what I was doing — not spamming activity, just didn’t like something else about me and got my domain put on the list. If your domain is listed on one or more URIBL service you can request to have it removed by working with your domain administrator. Yes, but the main problem I have is that getting onto an RBL takes NOTHING on my part — yet you will use that to judge me guilty. You can get someone put onto an RBL by *claiming* they are spamming — proof isn’t required. And that’s wrong. Maybe you guys are looking at it as a business thing, while I’m looking at it as an ethics thing. Obviously I don’t agree with what you’re doing, but thanks for being as transparent in your dealings are you are — that helps. Wouldn’t it be unethical of us if we knowingly accepted and published an article with an outbound link to a known & verified blackhat spammer website? We’re not talking “GREY” hat here or the occasional blocklists that EVERYONE on the Internet finds themselves on from time to time through no fault of their own. We’re talking about pure verified black hat. It’d be a disservice to our users and reflects poorly on us and everyone connected with EzineArticles. If you have a list where there can’t be a false positive then I’m all for it — it makes sense to do that. I currently work for a large(ish) ecommerce site which has a fairly well-set article writing system in place. And, like other ecommerce sites, it also has a few newsletters which (if anything) don’t get sent out as many times as they should. There is an opt-in process for said newsletter but many will tell you it doesn’t take too many idiots hitting the spam button in Gmail/hotmail/yahoo mail before your site gets put on the realtime black list. And this is for a white hat technique (not blackhat or even gray hat). So if I read this blog (and your subsequent comments) correctly you are telling ecommerce sites (or anyone who uses an opt-in email newsletter) that they will no longer be able to market their money site through EzineArticles. Is this correct? Let’s just say that, as an article writer, I’m not going to let EzineArticles put many more straws like this one on my back. More than 99.x% of our members will never even know this RBL filter exists. I’ve seen some of the URL’s we’ve deflected and I haven’t seen any false positives yet. It’s possible, but it will be rare. I’ll share more stats in the coming months that will hopefully put your mind to ease. Your stats run a little different to mine and your editors are, shall we say, their usual ‘helpful’ selves when it comes to resolving matters. But I have no energy for a flame war. Let’s just say you win, there are no false positives. The camel with the broken back. I think that this precaution is very good in general terms, even if it is not so perfect for everyone. By the way, I visited your blog again because I was looking for explanations about the click rate that is appearing now in our author page. How exactly is it calculated? I hope you’ll write something about it. Perhaps you already did… I may have missed a lot. Anyhow, today I noticed this detail and I found it very interesting. Thank you, Marc! I’ll remember that. Would love to know the RBL service you use, so other directories can follow suit. Sorry, we won’t be disclosing which RBL databases we use. I’ve never spammed in my life. My website does have a double opt-in newsletter that I have sent out a total of one time since my website was launched years ago. I can no longer publish articles on EzineArticles because I get that warning that my domain is a known spammer. I checked my domain on serpguard and it and google both give my site a clean bill of health, no spam warning. I have asked support to tell me which URIBL’s are calling me a spammer and haven’t gotten a reply. According to what I am reading here, you guys aren’t going to tell me. Is that right? I have been labeled a spammer and can’t even defend myself? After contributing almost 700 articles and following the rules this is how I am treated? I would like to see some proof from anyone out there that I am a spammer. In plain English, this stinks. I understand you trying to support the integrity of EzineArticles, but this isn’t the way to do it. Sorry to hear your URL got blocked. You’ve contributed 700 articles, yet you’re still hosting your website on a sub-domain of a domain you don’t own? Domain names are $10 per year. Have you considered moving your website to a domain that you own instead of someone else’s domain? YOU ARE SHARING A DOMAIN WITH THOUSANDS of other clients of homestead.com…many of whom probably don’t follow best practices when it comes to being a responsible emailer. Your reputation is tied to theirs…until you get your own domain. http://williewins.homestead.com/ and all subdomains on homestead.com were listed on an RBL database 12/3/09 at 18:01GMT. You could go here: https://admin.uribl.com/ as one place that you can look up your own domain and request a delisting, but that won’t fix the bigger issue: That your good reputation will always be in harms way because of the other thousands of clients who also use the same domain that you do (xxxxxxxx.homestead.com). Out of curiosity, I went to https://admin.uribl.com and looked up my site, and also looked up williewins.homestead.com and just plain homestead.com. According to URIBL, neither of them is listed on any blacklists. Am I missing something? And if my domain host, hostgator, hosts some blacklisted web sites, will my site be considered on a blacklist? There are plenty of authors on your site who don’t use their own domain. Blogspot is well-represented, for instance. I prefer to use my own, but I can understand why someone wouldn’t want to give up a long-established site and move to another domain, if what they have is working. While I understand the intent behind what you’re doing, I think not revealing which blacklist someone is on is the equivalent of not allowing an accused to view the evidence against him in court. How can you clear your name if you don’t know what you’re being accused of and by whom? Chris, I appreciate your help, but I also checked https://admin.uribl.com and homestead.com and my site, williewins.homestead.com are not on any lists. They are not blacklisted, but yet EzineArticles won’t let me publish my articles with those domains in my resource box. I have many domains with hundreds of pages on Homestead domains. I’ve had them for years and built them a long time ago when my computer skills were very limited. Redoing them all on new domains would be a major undertaking and very expensive. I agree with Eb, as well, what about all the blogspot users and how many homestead users are there on EzineArticles? Your URL is not listed right now on the RBL. Appears the Blacklisting on that domain has been lifted… I’m going to guess Bill requested to be delisted and their ruleset allowed it. Based on this info, Bill should now not have a problem submitting to us today. Eb… For now, I agree that our Member Support team will be able to reveal an affirmative yes or no if a domain in question is on the blacklist and if the members domain is listed on one of the RBL’s, we’ll share which one so they can negotiate directly with the RBL.